Here’s the scenario: You take a lot of pictures and some are remarkably similar because you don’t take any chances of missing the precise shot you want. Here’s the result: You get your shot, but then you have so many images that closely resemble each other that you practically go cross-eyed trying to distinguish among them. 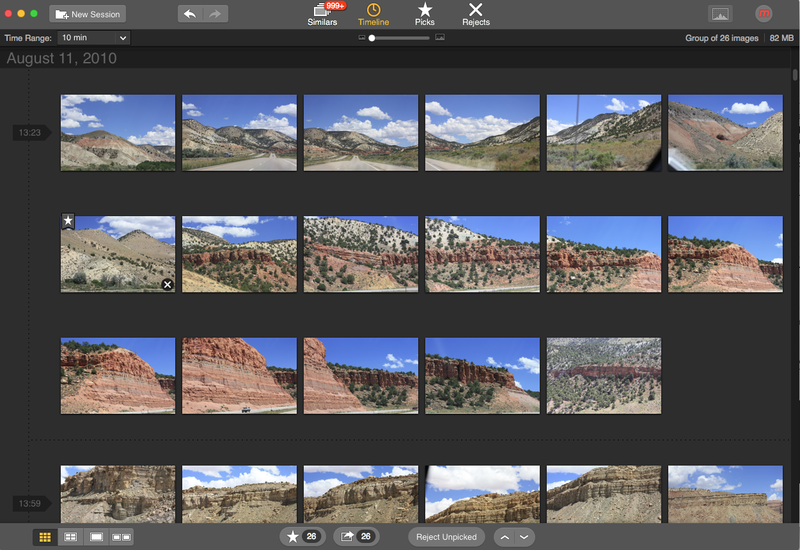 That’s where Macphun’s brand new Snapselect comes in. 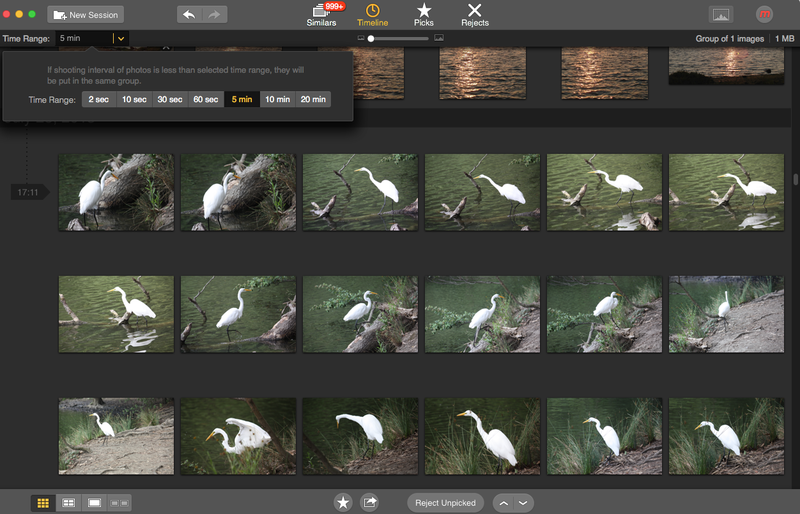 Snapselect automatically groups similar — though not necessarily identical — photos together according to selected time and accuracy levels, letting you choose to keep the best among them and discard the rest. 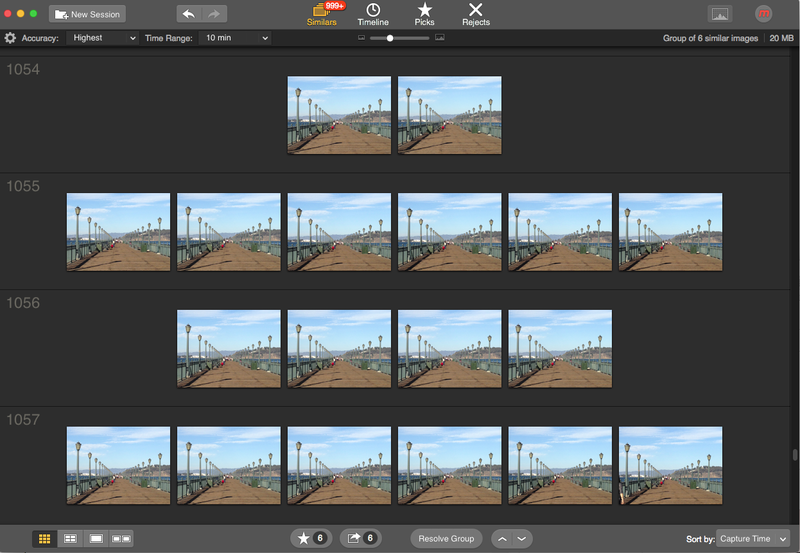 You can use Snapselect to remove duplicates, of course, but built-in functions in software packages like iPhoto are also available for that. Thus, Macphun concentrates equally on identifying similar photos, so that you can choose a single image or two to best represent a place, time, event or memory. Start by importing an image folder, an iPhoto, Lightroom or Aperture image library or the contents of your memory card into the app’s main window and click Start Session button. 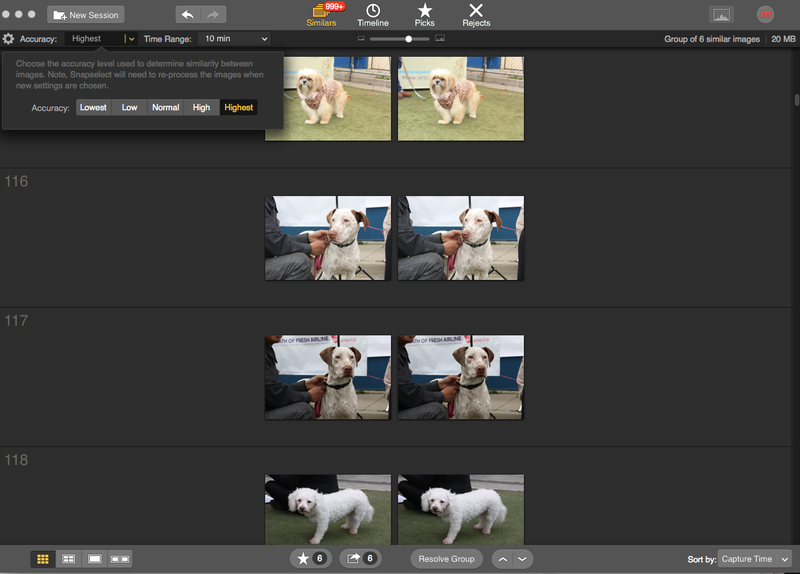 The app, which works via its own image recognition algorithm, displays photos in a timeline with duplicates and similar photos grouped in a Similars view that lets you select the best images. The Star button facilitates marking the images you like while the X button lets you reject an image. The Resolve button separates out picks from rejects automatically after you star your favorites. Once you have chosen, not chosen or rejected images, they are automatically moved to the Picks or Rejects view where you can gather them into a folder or export them as a group. Finding images shot within a five-minute span. I found the side-by side compare and the single view modes the easiest ways to judge images, as the rest of the photos in a group appear at the bottom of the window. 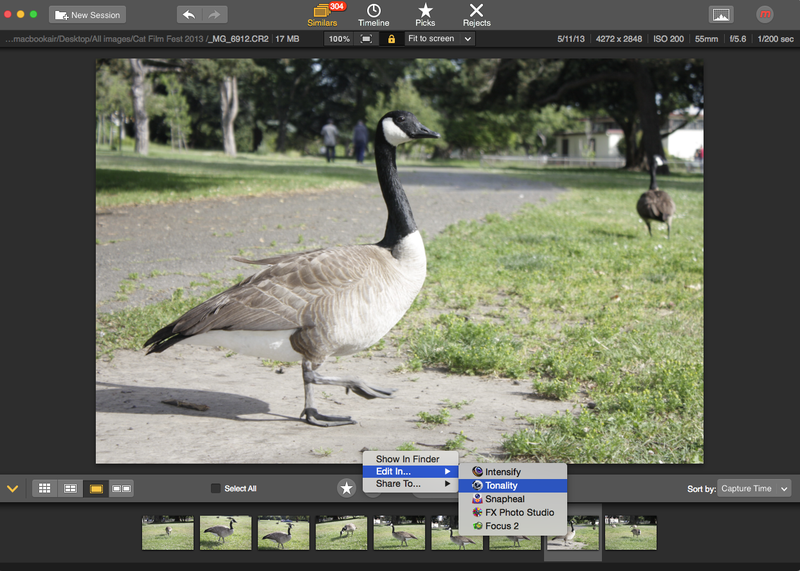 Snapselect integrates with Macphun’s own slate of apps, including Tonality and Intensify for further editing of your selected photos and supports most popular image formats, including Raw. Similars with the side-by-side view. Snapselect currently works only with one image library at a time, but you can load multiple image folders into a session. It also does not read previously set library tags or stars. This 1.0 version of the app was somewhat slow in importing and analyzing images — it took about five minutes to analyze some 5,000 images in my iPhoto library — not a serious bottleneck, just long enough to get impatient. Macphun is aware of the issue and says that an update is on the way shortly that will improve performance. Snapselect provides a needed service to all levels of photographers, particularly those dealing with an overabundance of similar shots. Be prepared to be brutal in judging and eventually throwing out a good portion of your images, but in the end, you’ll be more satisfied with the collection that remains. 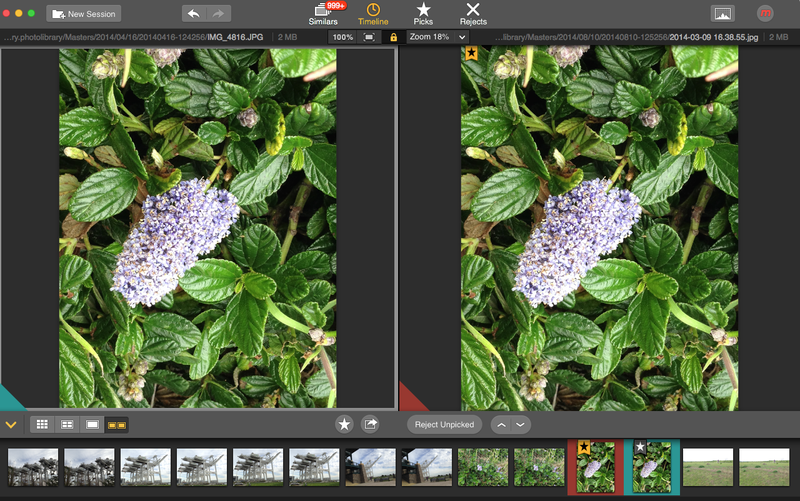 Choose your favorite and then open a Macphun editing app to enhance it. The app is available on the Mac App Store at an introductory price of $14.99 until January, after which it will sell for its regular price of $24.99. The company is also sponsoring an instructional webinar to familiarize users with the app’s fine points.